PKC-Beta antibody LS-C17449 is an unconjugated rabbit polyclonal antibody to PKC-Beta (PRKCB) from human, mouse, rat and other species. Validated for ELISA, ICC, IHC and WB. Synthetic peptide corresponding to a distinct C terminal region, (SFVNSEFLKPEVKS resides 660-673) from rat protein kinase Cbeta2. Percent identity by BLAST analysis: Human, Gorilla, Gibbon, Monkey, Marmoset, Mouse, Rat, Hamster, Elephant, Panda, Bovine, Dog, Bat, Rabbit, Horse, Opossum (100%); Platypus (93%). Based on known homologies, expected to react with most mammalian species. 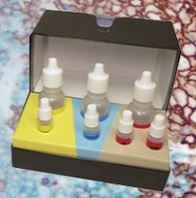 Suitable for use in Western blots, ELISA, Immunocytochemistry and Immunohistochemical techniques for fresh or frozen sections. Paraffin embedded or fixed tissues have not been tested. For Immunohistochemistry, immunocytochemistry and Western blotting using alkaline phosphatase or HRP, a dilution of 1:250 is recommended. With a more sensitive detection system, such as enhanced chemiluminescence or ELISA, the antibody may be diluted further. Optimum dilutions to be determined by researcher.